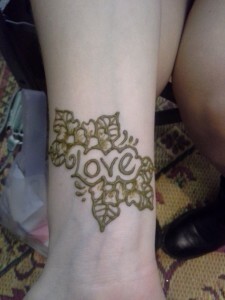 Henna and glitter are great ways to make any party special. Aside from the fun of having them done, they leave a lasting impression that will put a smile on everyone’s faces for days or weeks, every time they see their design. As the first professional henna artists in New England, we are among the most skilled and fastest artists in the US. We are proud to provide exceptional service, highest quality and safe ingredients, and designs that you will be proud to wear, plus have fun while we do them. A one hour event is $150. Two or more hours are $120 each, and two hours is the minimum for Friday, Saturday, or Sunday events. For events that end at or after midnight, rates are $150 per hour per artist. This would be for henna, or glitter, or both. Please let us know your preference, so we know what to bring. There may also be a travel fee, depending on location, but we try to keep that very reasonable. There are never any per-person or per-design charges. There may be further discounts for events with longer time frames or multiple hours. Please mention your event details to get the most appropriate quote. If you have a fundraiser, please go here for more specific info: Fundraisers.